This entry was posted in Traveling Days and tagged castaway caboose, durbin west virginia, fall foliage, harrisonburg, steam train, waynesboro. Bookmark the permalink. Oh Dianna those photos are really pretty! Not an “optimum” day for a 6-hour drive, nor a fall foliage train trip BUT I know you had a blast with your friends and you sure got some pretty pix! Beautiful shots!! I love snow in the mountains! What an adventure! I know you 4 had a great time. Beautiful photos. What beautiful pictures! The red caboose and the ice around it, …the hint of orange, or was it brown in the top photo? The green, orange, gray smoke, black locomotive and hint of yellow. During NaNoWriMo, your pictures speak thousands of words. Each of these is beautiful. Really. I love the picture of you with your camera. 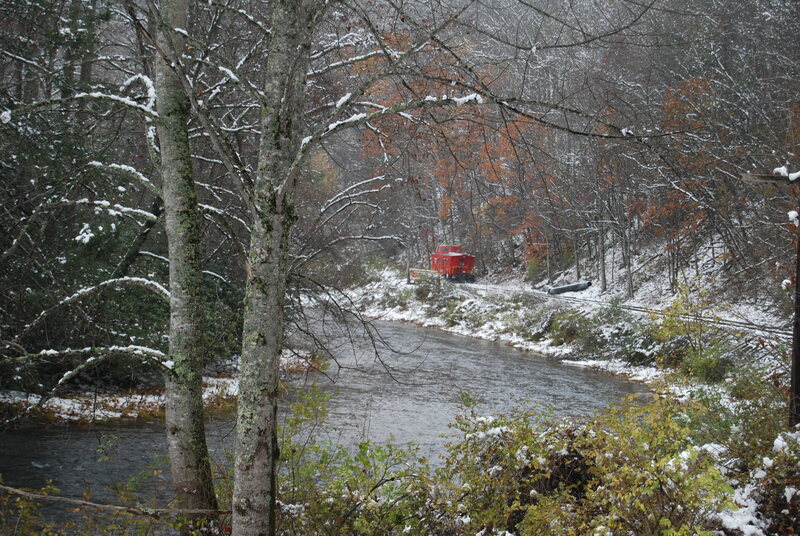 such pretty country… the little red caboose really POPS out against the snow – well done! How lovely! I would love to stay in a little red caboose overnight — imagine the stories told around the woodstove! That ride was just beautiful. I would also love to stay in that caboose for a night or two! On a side note, it’s so funny to see the snow there already while we have none in MN. yet. I’m trying to figure out the date of your weekend. It must have been after the 23rd of Oct. Coming back from my Walton Reunion trip, all I saw was beautiful Fall foliage (in all three states that I passed through). This must have been an amazing trip…..beautiful!!! Grace, it was last weekend, 10/29 and 10/30. A beautiful mix of “fall” and “winter wonderland” !!!! ooh, that looks cold! and, yeah, i’d not be excited about staying out in a RED caboose out in the middle of nowhere! you can’t exactly blend in to your surroundings and hope no one coming by notices you! eek! West Virginia is a beautiful state in any kind of weather. Glad you had a “safe” time driving on those roads. They still scare Harold a little bit. Next time take a picture of a coal tipple!!! Better you than me on that trip!!! But I sure do enjoy looking at those beautiful ‘snowy’ pictures. You always have neat adventures. Well, beautiful for sure! 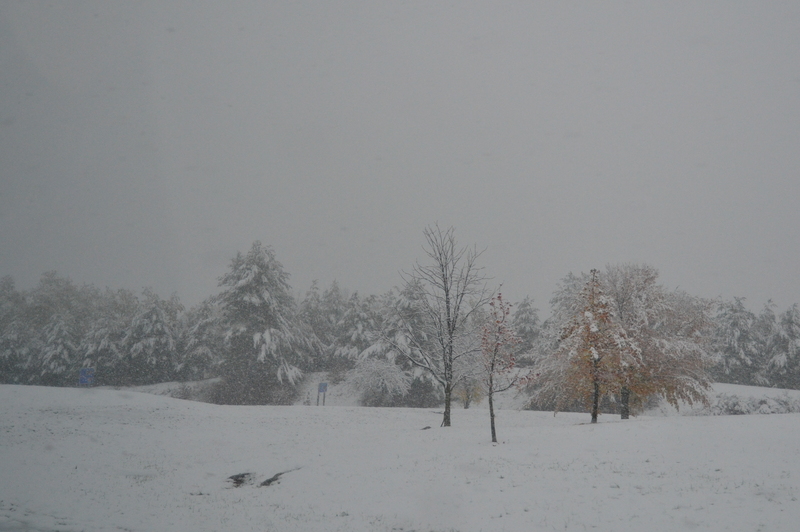 But so crazy this october snow! There’s a train ride I’m determined to take next fall in New Hampshire during peak foliage ~ hopefully we’ll make it before the snow arrives! I can’t believe all that snow! And here I was complaining that in the South we got some “chilly wind”! Oh your pictures are beautiful. I’ll bet it was cold though!!! Another great series here!, but the last one is my fave this time…. it almost looks like autumn leaves fell on a snow-covered forest ! Well, the snow scenes are certainly beautiful even if it was unexpected! I wouldn’t want to spend the night in a caboose without communication. I’m not that brave. 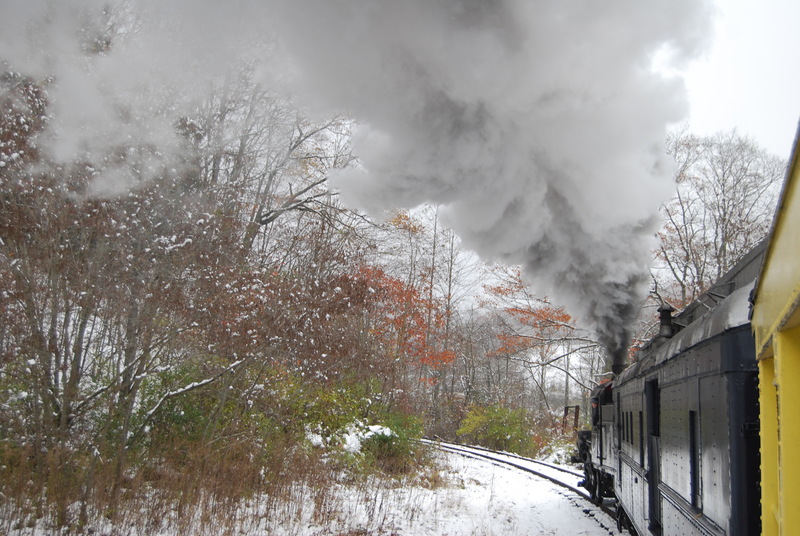 Hope you enjoyed the trip even if the snow did cover up the fall foliage! Have a wonderful weekend! 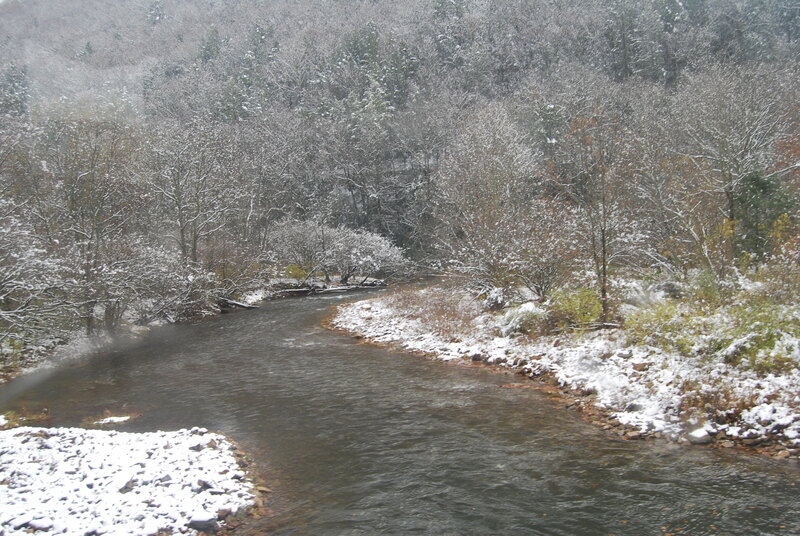 Your snow scenes are quite beautiful along with the foliage shots. It kinda looked like it does here. Our usually noteworthy foliage pretty went from green, to brown then down. Due to the lack of rain this summer. Bummed this Ozark Farm Chick out. 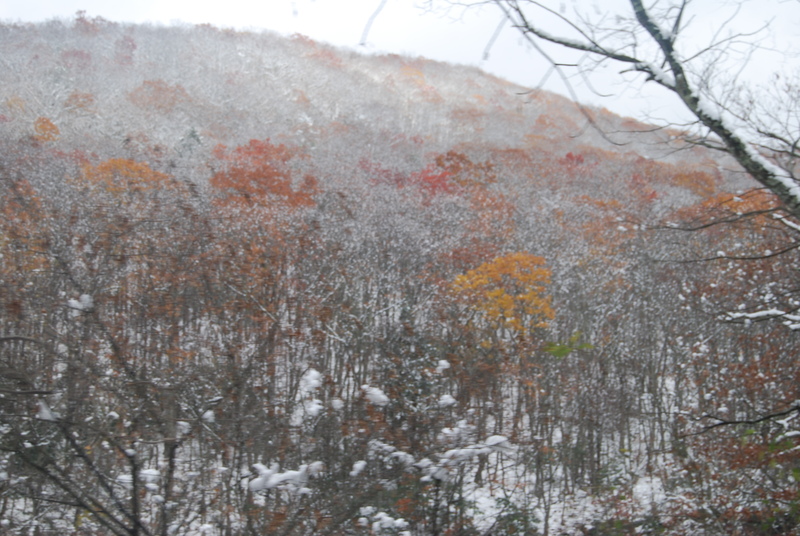 That’s very, very pretty — the fall colors mixed in with the snow. An unusual occurance? Loved it! This was one of my favorite trips you’ve made! The pictures are beautiful and I hope you don’t mind me putting them in my “to paint” folder! It was very beautiful, but very very scary going across the mountain in the snow. I can’t believe Diane was never afraid of the snow on the road. gorgeous all the same!! 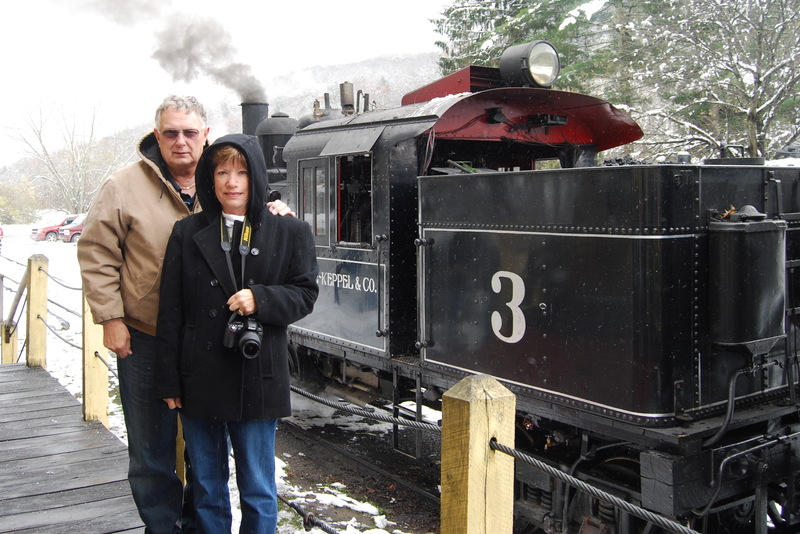 i LOVE trains….rides and whistles!! Winter wonderland in Autumn. Yep. It was a mess up here for a few days. But the photos are lovely. I am looking forward to playing with my new camera during a good snow storm this winter. I’ll have to let my Dad know about that train. He loves trains, too. I’m glad to see you were dressed for the weather, that could have been a pretty miserable day otherwise. You still got some great pictures, even if most of the leaves were covered/gone. 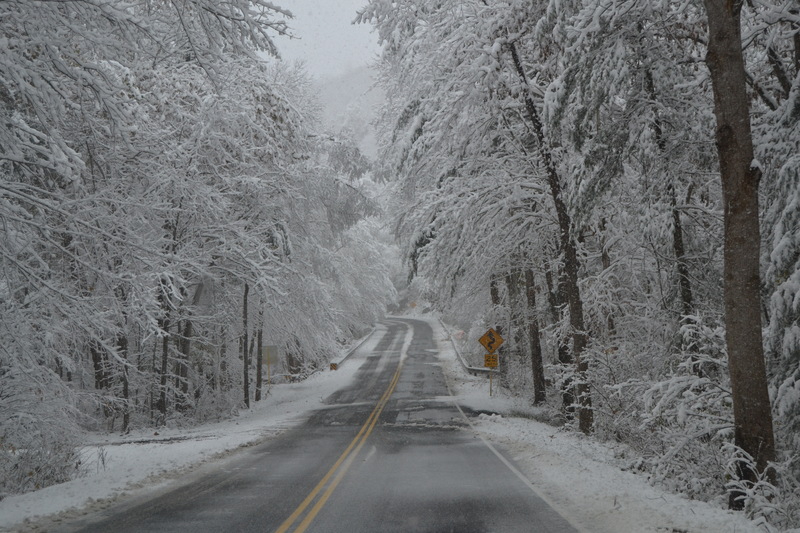 Great winter-time scenes in October!! Thanks for sharing your photos and also a description of your trip. The lil’ red caboose does pop against the snowy background…but I’m not adventuresome enough to want to overnight there in such a remote location! I have been to West Virginia but never have I seem this type of beautiful. Wonderful pictures! Have a good weekend. How beautiful! I didn’t realize that West Virginia had this much snow from the storm. Stunning!